This new version now has all 5 pins broken out on the connector. 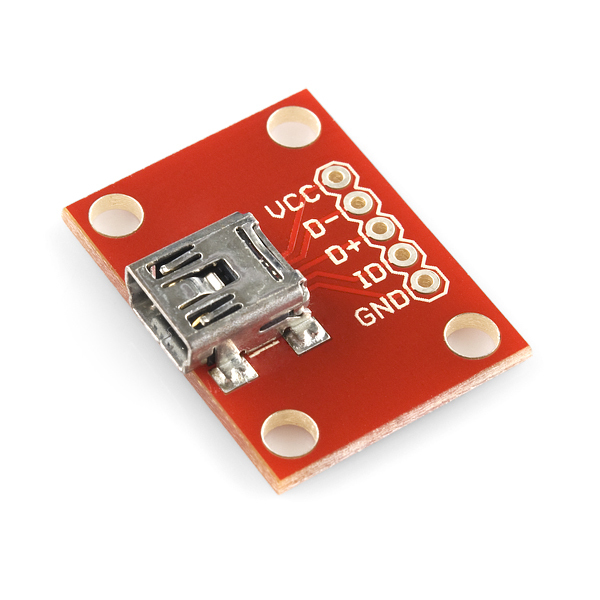 We have no idea what USB device you are hooking up to, but if you need to add a miniUSB/USB Mini-B connector to your breadboard - here it is. Also good for an un-regulated, non-limited 5V supply up to 100mA. Anyone have a schematic to connect this to the atmega328? That's tricky and depends on what you want to do. The ATMega328 does not support USB, so you would need some sort of interface depending on what you were looking to do. 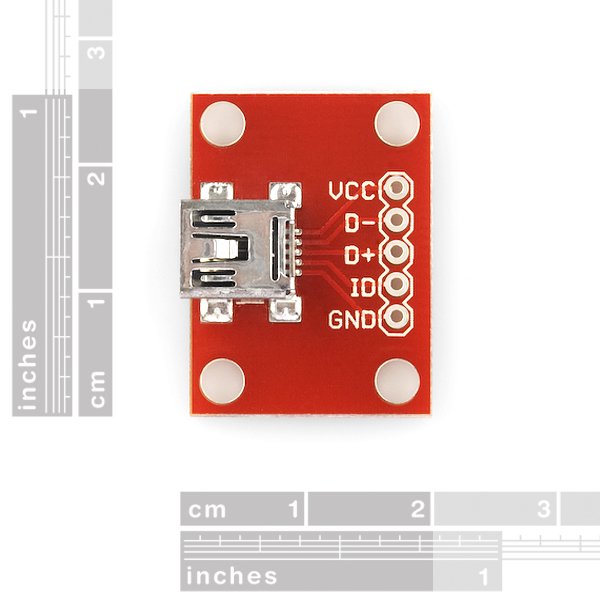 Sorry for the stupid question, but would this board predominantly be used for making temporary connections for boards such as the Arduino Pro Minis which lack a USB connection for the purpose of programming them? 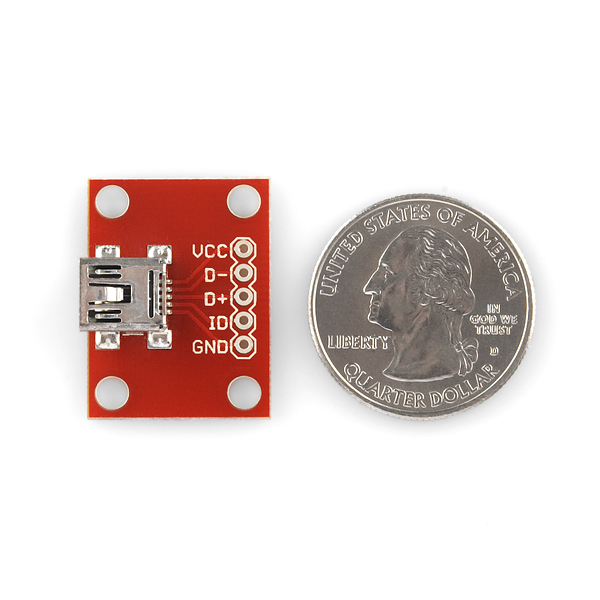 I assume by using a temp connection, this board could be used to program multiple Arduino Minis? sorry, found the answer i needed - im looking for an FTDI board/cable. May i take this time to think all you ppl for those tutorials. I am forever in your debt for teaching me how to fish. Where can I find the Eagle file for this board? Sorry about that, there's now a download link following the product description. Does "Also good for an un-regulated, non-limited 5V supply up to 100mA" mean that you can plug a wall wart power plug with mini-usb connector into it to power a project (with appropriate regulation/filtering)? is it really only 100 mA? I'm almost positive it's 1000 mA, did y'all leave out a third zero by accident? edit: for what it's worth, I'm only planning on making a very short charge-only cable for use with wall-wart USB adapters... will I run into problems pumping more than 100mA or will the wall adapters know not to? I believe the USB spec allows the host to supply up to 100 mA for "unknown" USB devices. For recognized devices (i.e., the host OS has a driver for it), the host can supply up to 500 mA. I want to know the difference between "BOB-08401" and "BOB-09966", Could you tell me infomation about their deimensions, etc..? BOB-09966 breaks out the ID pin. BOB-08401 does not. Their dimensions are the same. what is the pin spacing?.1"? Same here... Would like to not have to do the SMD soldering. some devices will send information about itself over that pin. for all practical purposes the ID pin can be left disconnected. 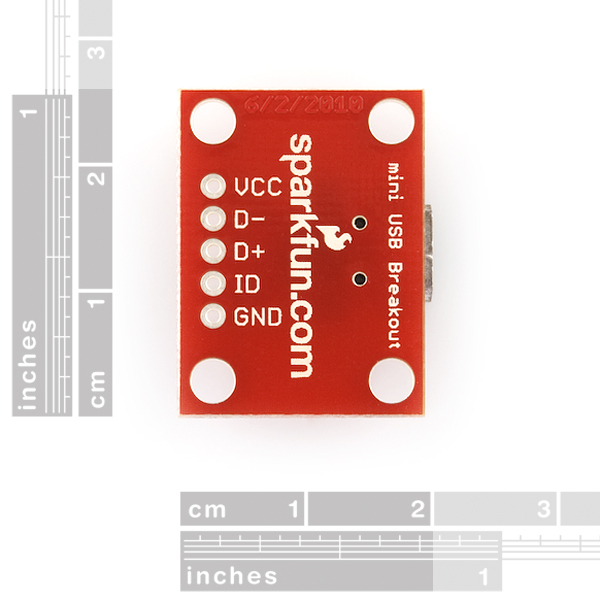 Standard good quality SparkFun construction. Versatile with 5 pins. Many uses. Works very well.. I really like the connection pin spacing.. It fits 0.1 pin headers perfectly. Very well made and works perfectly. I use these on prototyping boards to power projects. Since I seem to have a surplus of wall worts with mini usb connectors, makes a very fast way to add power without having to add voltage regulators to the project.